NEW YORK U.S. stocks closed higher on Friday as the Mediterranean island nation of Cyprus scrambled to find international aid to rescue its cash-strapped economy. Investors were drawn by strong earnings from major companies, including Nike (NKE) and Tiffany (TIF). Even with Friday's rise, the S&P 500 remained on course for its worst week in a month. The damper on U.S. stock markets was caused by another worrisome chapter in Europe's debt crisis, and some disappointing corporate news. The Mediterranean island nation of Cyprus, a banking haven, is struggling to devise a plan to avoid financial collapse. Stocks were also weighed down on Thursday by weak sales from Oracle. That news brought down technology stocks. On Friday, though, investors took advantage of the pause and got back into the market. The global economy has remained resilient in the face of a series of crises this year. That has encouraged investors to pick up stocks on any dips, said Ron Florance, managing director of investment strategy at Wells Fargo Private Bank. "We still have an astonishing amount of money sitting on the sidelines," said Florance. "The individual as well institutional investors have been sitting it out." Investors have remained optimistic because U.S. housing is recovering and companies are hiring more workers. Healthy profits for corporations and continuing stimulus from the Federal Reserve have also boosted stock prices. The Dow Jones industrial average rose 88 points, or 0.6 percent, to 14,509 as of 1:27 p.m. EDT Friday. The Standard & Poor's 500 index rose 11 points, or 0.7 percent, to 1,557. The Nasdaq composite gained 24 points, or 0.7 percent, to 3,246. Nike shares hit an all-time high, rising 12 percent after the company reported a 55 percent spike in quarterly net income. Tiffany rose $1.77 to $69.69 after its strong fourth-quarter earnings. Despite Friday's rebound, the S&P 500 is five points, or 0.3 percent, lower than it was at the start of trading on Monday. The broad index last logged a weekly decline Feb. 22, falling 0.3 percent, after investors were spooked by the minutes from the Federal Reserve's January policy meeting. The minutes revealed disagreement over how long to keep buying bonds in an effort to boost the economy. 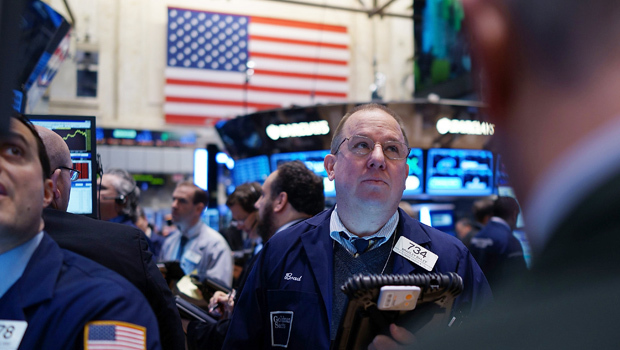 A pause in the stock market rally is now due because gains this year overstate the improvement in the economy, said Terry Sandven, chief equity strategist at U.S. Bank Wealth Management. The biggest risk to the market run-up this year will come when the Fed faces increasing pressure to end its stimulus program. That could happened if the economy continues to improve and stock markets rise, said Sandven. The yield on the 10-year Treasury note was unchanged at 1.92 percent. Micron Technology (MU) rose 94 cents to $10.02 despite reporting a loss in its fiscal second-quarter later Thursday. The chipmaker said that revenue grew 3 percent, to $2.08 billion, better than analysts had expected. Anacor Pharmaceuticals (ANAC) climbed $1.55 to $6.40 Friday, after the drug developer reported strong data from a mid-stage study of a potential chronic rash treatment. Marin Software (MRIN), a marketing software company, rose $3.25 to $17.25 on its market debut. The San Francisco-based company raised $105 million in its initial public offering. AK Steel Holding fell 12 cents to $3.35, after projecting a larger-than-expected first-quarter loss because a previously expected seasonal increase in demand for steel hasn't materialized.